Lithobraking is a technique of descent by an unmanned space vehicle (usually a probe) to the surface of a body by which the vehicle is slowed by impact with the body's surface. The word was probably coined as a whimsical adaptation of aerobraking, which is the process of slowing a space vehicle by the use of friction against a planet's atmosphere. Lithos is a Greek word meaning "rock" or "stone." Preparations for lithobraking involve protecting the probe with sufficient cushioning to withstand an impact with the surface and come to rest undamaged. The Venera landers used shock absorbers. More recently, airbags have been used. Incoming angles are made acute enough such that the impact has the characteristic of a glancing blow, rather than a direct impact on the surface; it has been speculated that the Beagle 2 lander was destroyed on landing because it struck a vertical cliff at the lip of a crater. In the case of bodies with a sufficiently thick atmosphere (e.g., Mars), lithobraking is typically accompanied by the use of heat shields and parachutes to reduce the speed prior to impact. The Mars Pathfinder and Mars Exploration Rover programs have used this approach successfully. Alternatively, the incoming velocity can be used to enable the probe to penetrate the surface. 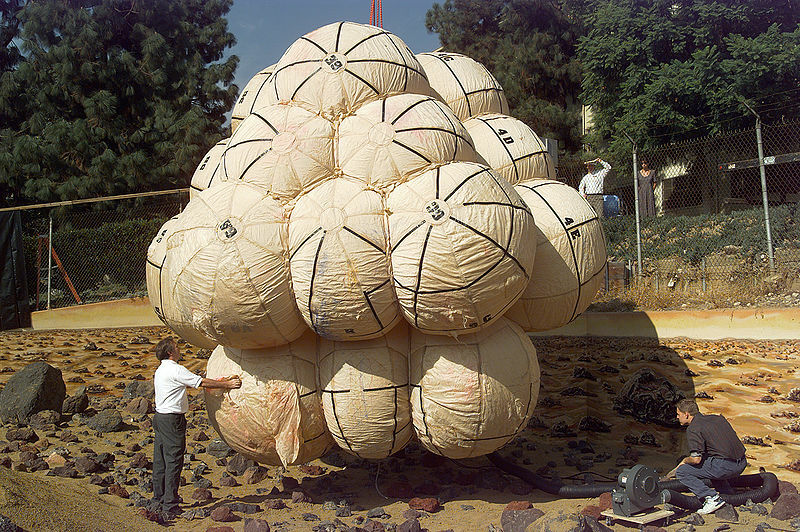 This approach can be tried on bodies with low gravitation, such as comets and asteroids, or on planets with atmospheres (by using only small parachutes, or no parachutes at all). Several such missions have been launched, including penetrators on the two Phobos probe landers targeted for Mars' moon Phobos and ones for Mars itself on Mars 96 and Deep Space 2, but so far none have succeeded. The cancelled LUNAR-A probe would have carried penetrators to the Moon. Certain concepts involve the spacecraft in an orbit tangent to the surface of the body in question, and "docking" with a magnetically levitated (maglev) train, and the train then slowing. This qualifies as lithobraking, as the reaction mass is the planet itself. This technique requires extremely precise guidance and control, in addition to a large infrastructure, and is thus not yet a viable option - although it may be in the future. An advantage to this method is that it can also launch spacecraft, without needing propellant. The term is also sometimes used as a euphemism to describe situations in which lithobraking was not the original desired landing method - i.e., crashes. ^ Binder, A. B. "Lunar Landing via a Linear Accelerator". http://adsabs.harvard.edu/full/1988LPICo.652...26B.